Since this cold, dreary weather has not been wonderful for outdoor fun, I have been enjoying lots of movie time with my family! Heading out to the movies as a family is such a treat. If you could use a little indoor family time with your family or a few friends, read on for more information about this new family friendly movie and how you can score some free first come, first served seats and also enter our fun giveaway for RESERVED seats (5 Winners) to the upcoming local screening of THE KID WHO WOULD BE KING. 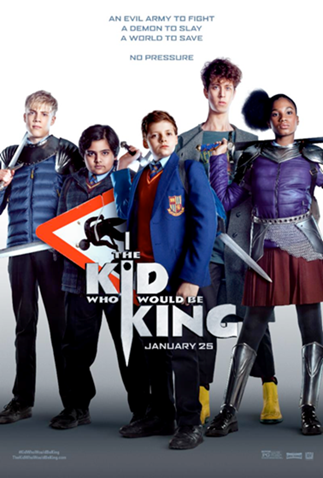 Would you like to be one of the first to see a screening of THE KID WHO WOULD BE KING before its official release on January 25th? Lucky for you we have a special link with a select number of screening passes for our readers! **There are a limited number of passes available for each screening. Once the passes have been claimed, the link will note that the screening is full. *Please note: If you do receive a screening pass, RSVPs do NOT guarantee seats at the screening. If theater is overbooked, seating is filled on a first-come, first-serve basis. Guests are encouraged to arrive early. You and your guest must enter the auditorium together. I also have FIVE family 4 packs of guaranteed RESERVED seats to give away to the upcoming screening of THE KID WHO WOULD BE KING to FIVE lucky Delco Deal Diva readers – as well as an awesome prize pack! You must be local and able to attend the screening you are entering below. Tickets are non exchangeable. Enter via the easy Rafflecopter form below. The more you enter, the better your chances! Good Luck! If you go to see the film, be sure to come back and let us know how it was! We do not go to the movies often enough since dad is working all the time.